Macy’s Merchandising Group of New York is recalling about 18,900 Martha Stewart Collection Whiteware cake knife and server sets. The company has received four reports of the handles on the knife and server breaking, resulting in lacerations, including cuts requiring stitches. This recall involves Macy’s Martha Stewart Collection Whiteware cake knife and server set. The set includes a knife and a cake server. Each is about 11 inches long. Both the knife and cake server have a white, textured ceramic handle. “Martha Stewart Collection” is embossed on the metal where the blades meet the handles. UPC 608356963330 and Product ID PRCDCKSRVR are printed on the product packaging. 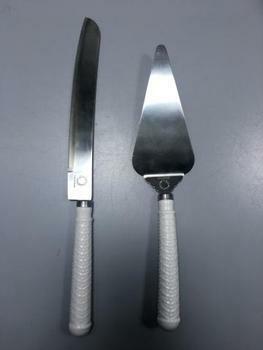 The cake knife and server sets, manufactured in China, were sold at Macy’s stores nationwide and online, and at Military Exchanges between January 2014, and July 2017, for about $25 at Macy’s and $15 at Military Exchanges. Consumers who purchased the product from a Macy’s store should return the product to a Macy’s store for a refund of the purchase price. Consumers who purchased the product from www.macys.com should return the product to macys.com or a Macy’s store for a refund of the purchase price. Consumers who purchased the product from a Military Exchange should return the product to a Military Exchange for a refund of the purchase price. Consumers may contact Macy’s toll-free at 888-257-5949 from 10 a.m. to 10 p.m. (ET) seven days a week or online at www.macys.com and click on Product Recalls at the bottom of the page for more information.